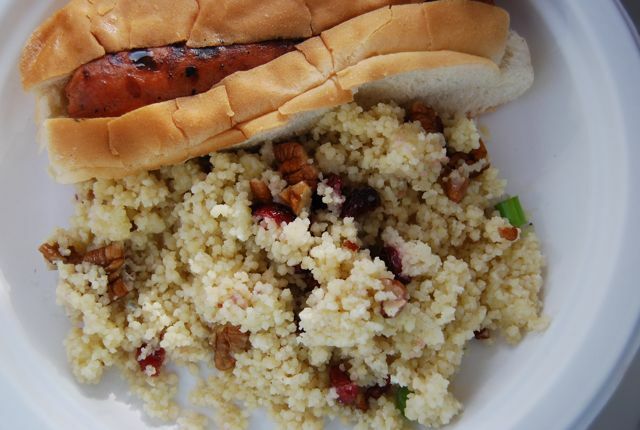 This easy Couscous Salad is one of my favorite cold salads ever. It is so simple to make and can be served warm, cold, or at room temperature. It contains so many interesting flavors and you can add in nearly anything you might want if you want a new twist. Since there is no mayonnaise in this salad it is also great for large picnics, you don't have to worry about sun exposure! When you make this be sure to assemble everything at least a few hours before you want to serve it so there is plenty of time for the flavors to marry and really blossom. 1. Prepare couscous according to package directions. 2. In a small bowl whisk together olive oil, vinegar, lemon zest and lemon juice. Set aside. 3. Pour prepared couscous into a large bowl and fluff with a fork. Add dried cranberries, blue cheese, scallions and pecans. Stir well until completely combined. 4. Add dressing and mix until salad is completely coated with dressing. 5. Add 2 pinches of salt, or more, to taste. 6. Serve warm or at room temperature. Can be stored, covered with plastic, in the fridge. How to Make Cherry Baby FoodLunchbox Nutrition: Which Kind is the Better (Nut) Butter? Kelsey Banfield, The Naptime Chef, believes parents don't have to give up being foodies just because they have kids. Kelsey's website features webisodes, recipes and ideas on how to fit delicious food into everyday life, without compromising quality or taste. Kelsey is also the author of the newly published cookbook, The Naptime Chef Fitting Great Food Into Family Life.